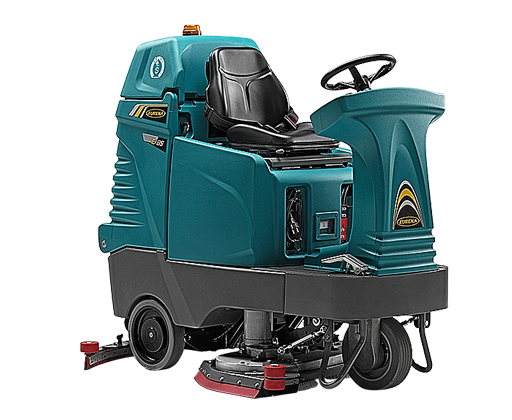 The Eureka E85 is an innovative ride on scrubber-dryer, extremely robust and efficient, engineered to guarantee exceptional performances even in the toughest industrial environments. WHY IS THE E85 SCRUBBER-DRYER SAFE TO USE & RELIABLE? 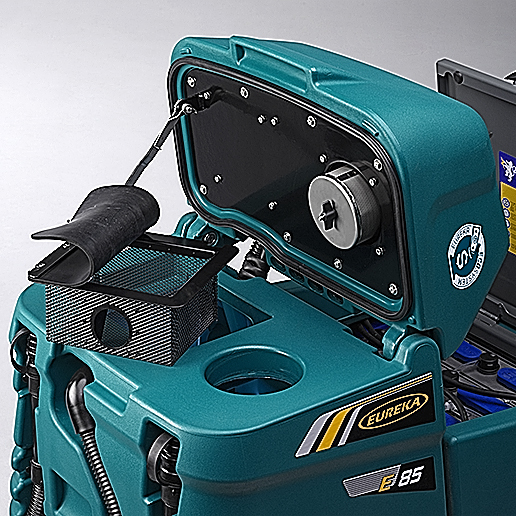 The E85 scrubber-dryer offers the standard Eureka S.p.A. security features such as: reverse speed beeper, claxon, anti-tilt bars, front and rear lights, warning light, low centre of gravity for better stability, wide view visibility, anti-shock button and the water level sensor. 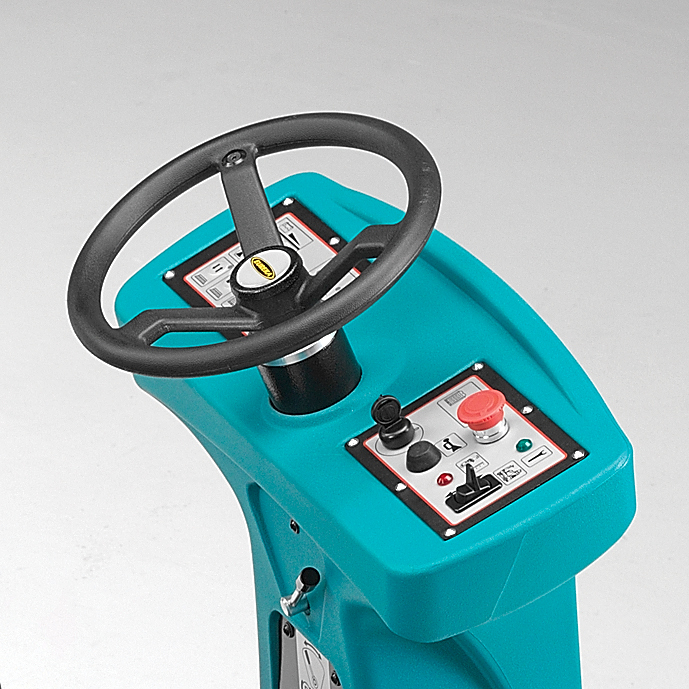 For safety reasons the traction motor with electric braking system decelerates the machine while turning, the scrubber dryer can be started by a convenient starting key and there is a parking brake. The E85 also operates at a very low level of noise making the machine ideal for noise sensitive environments and aiding greater operator comfort. WHAT IS THE ECOSYSTEM® IN E85 SCRUBBER-DRYER? The exclusive ECOsystem® system designed by Eureka S.p.A. maximises the use of the available water solution. The operator is not required to spend long periods of time emptying and refilling, therefore uptime is significantly improved. This unique method utilizes water in such a way that you will increase productivity, reduce costs and reduce the environmental impact of cleaning. In addition, the exclusive automatic sanitation of the ECOsystem® in E85 sanitize the circuit thoroughly and effortlessly. WHY IS E85 ROBUST & RELIABLE? The E85's steel structure is entirely manufactured in Eureka, where it is treated with zinc phosphate and painted with cataphoresis system in order to increase resistance and preserve the material over time even in the most aggressive environments. HOW CAN I INCREASE BRUSH PRESSURE ON E85 SCRUBBER-DRYER? 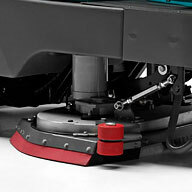 It is possible to adjust the brush pressure according to the specific floor conditions. 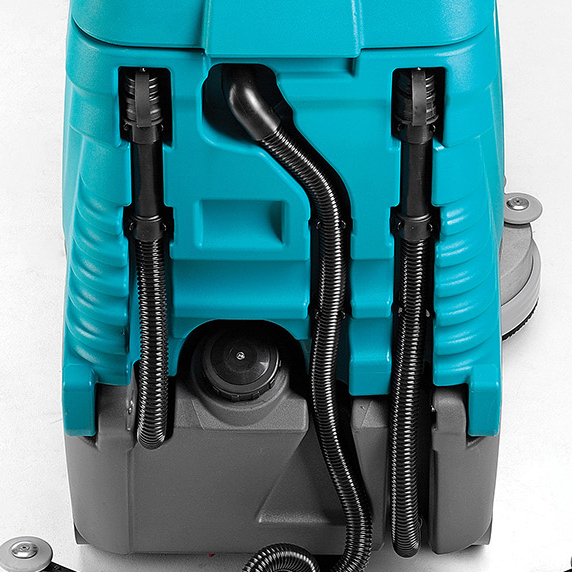 The operator may choose between two different types of bush pressure, the setting for every day cleaning provides 46 kg of pressure, however pressure can be increased to 67 kg which enables effective cleaning of even the most dirty surfaces. HOW CAN I ADJUST THE E85 SCRUBBER-DRYER SOLUTION FLOW WHILE CLEANING? The E85's solution flow control function enables the adjustment of solution according to floor conditions. Via the intuitive display panel the operator can choose from the lowest level (1) up to the highest level (5) using “+” or "-" buttons, the level of solution is indicated on the display. WHAT IS THE E85 SCRUBBER-DRYER CLEANING CAPACITY? 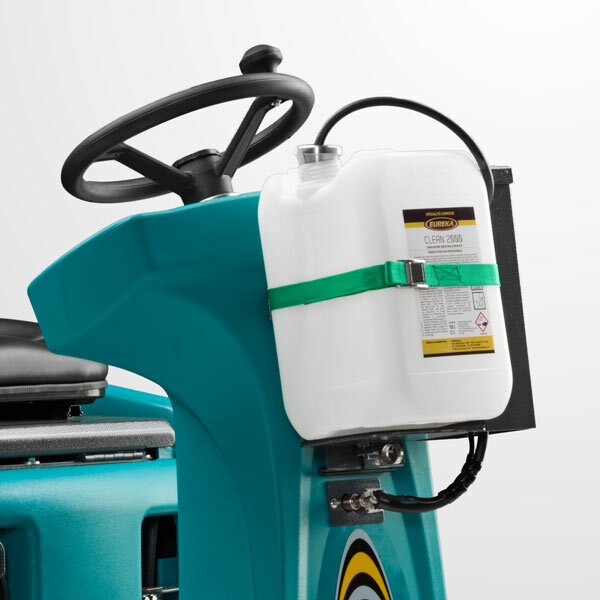 The E85 cleaning capacity is even 6.075 m2/h thanks to a cleaning path of 810 mm and a forward speed of 7,5 km/h. 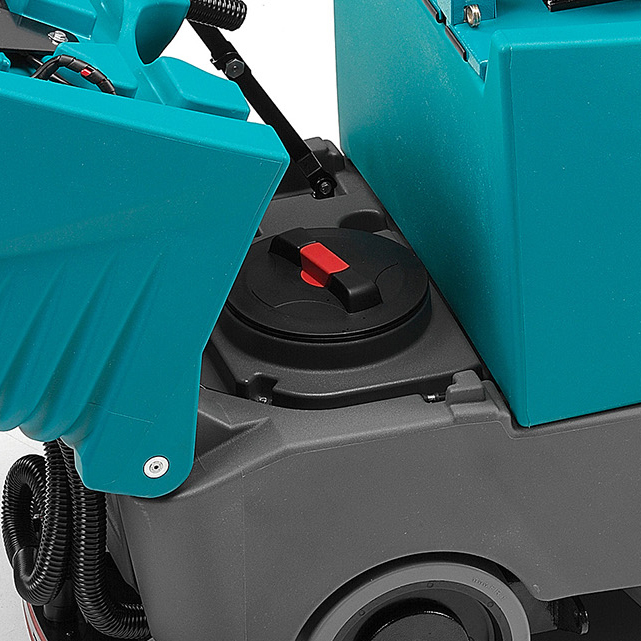 The filter protects the vacuum-motor against dust and debris to ensure greater durability and a longer life. The stainless steel basket retains bulky waste collected during the drying phase, allowing for quick and easy disposal. The tank has a capacity of 120 liters, expandable up to an impressive 360 liters with the activation of the ECOsystem®. 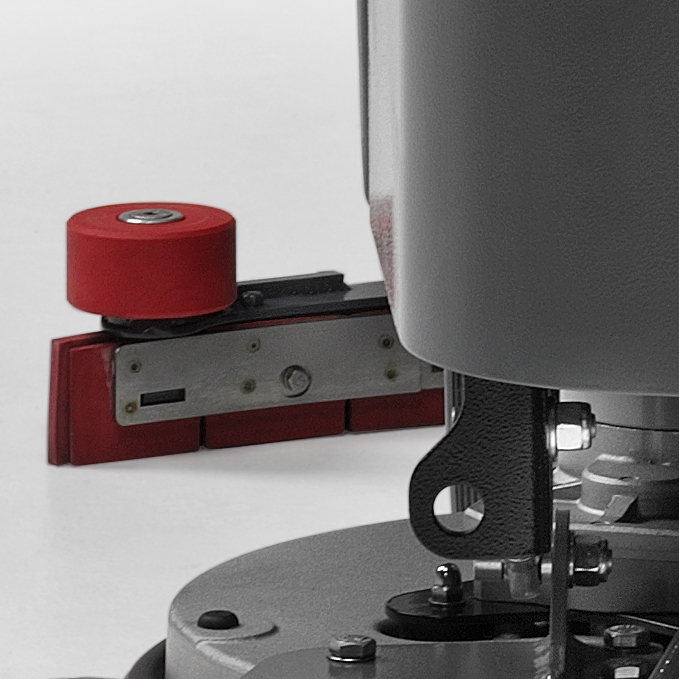 Convenient access enables easy filling, inspection and maintenance. 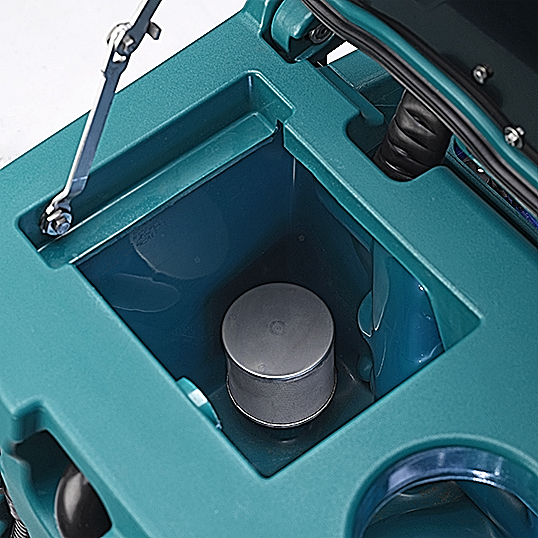 E85 is equipped with a large porthole which easily facilitates the the recovery tank cleaning operations. In addition the automatic sanitation of the ECOsystem® allows sanitization thoroughly and effortlessly the ECO circuit throughout its entirety. The flexible end provides control over the flow of water when emptying the recovery tank. The multi-function display is equipped with intuitive, simple to use, one-touch controls. 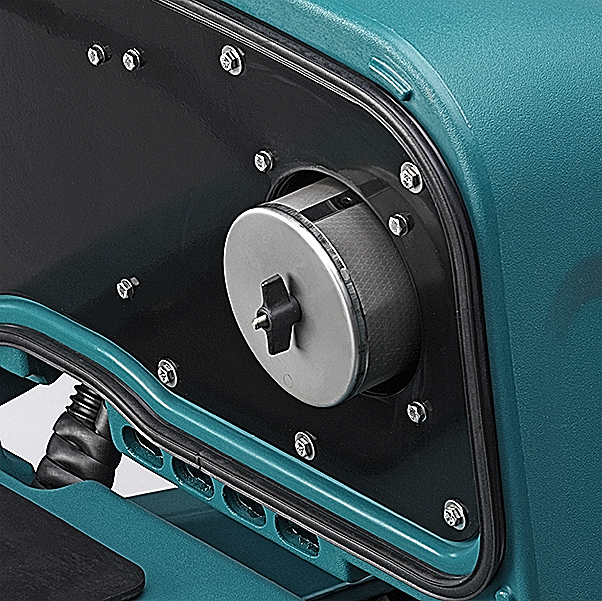 The motor sits in the nose of the machine, driving the front wheel via a lubricated gearbox, in this position it is protected against impact and humidity. The squeegee can be easily adjusted to any type of floor to guarantee optimum water pick-up. 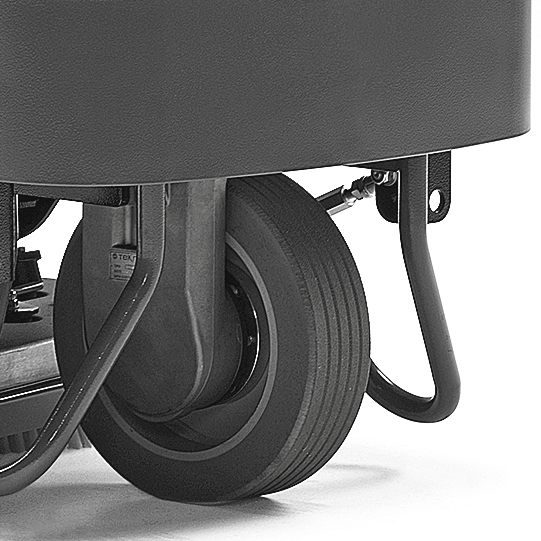 The reversible squeegee blades and “quick-change” system reduce maintenance costs and downtime. The floating skirt automatically adjusts to the floor surface, preventing solution splashing or leakage and ensuring optimum water pick-up. 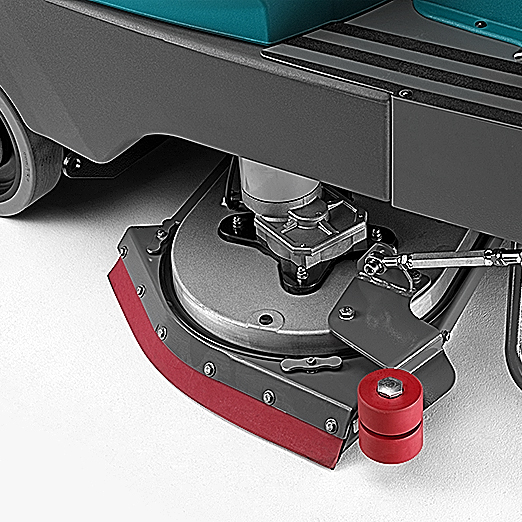 Adjust the brush pressure according to floor conditions, including smooth surfaces where no abrasive action is required. With frame and specific components in stainless-steel, Eureka machines in Chrome® guarantee resistance to rust, humidity and the corrosive actions of detergents.